This Paper Plate Bird Craft using Torn Crepe Paper Strengthen fine motor skills with tearing paper for a cute spring craft for kids. Birds and animals are a child’s favorite topic. There are so many ways to learn about them: from colorful crafts to books to interesting videos. I believe kids grasp even complex details when they are intertwined with fun and play. 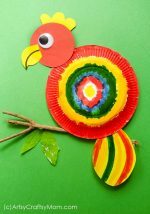 This colorful Bird Craft is a great lesson for those times when you need a quiet art activity. Tearing and gluing small bits of paper may seem like a potentially frustrating activity for a 7-year-old, but every time I do this craft with kids, I’m always surprised with the deliberate nature in which the kids apply their “feathers”. If you have been following my work, you’d know by now that paper plates have more uses than one. 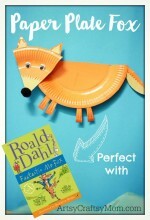 Set your imagination free with these fabulous paper plate craft ideas. 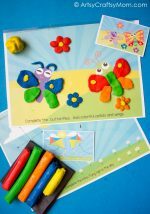 Practice – Scissor Cutting Skills, Pincer Grip to tear & glue, Composition & Texture Art. Cut the paper plate in half. We used an 8-inch normal paper plate. 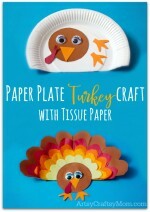 If you are using a bigger paper plate, remember to cut out bigger crepe paper scraps. 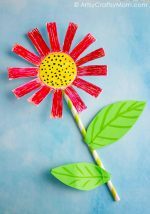 Tear up the crepe paper (use as many different colored papers as possible) into tiny bits using a child-safe scissor or your hand and paste them on the paper plate using a glue stick. Start from one end layering paper as you move forward. TIP – Apply glue on the paper plate instead of on the paper scraps. Will help with kids who hate sticky fingers. Using a scissor, trim along all the edges. Ask kids to measure crepe ribbons as long as the bird. Teaches them about non-standard length and measurement. Now, staple together the bunch of crepe ribbons (again use a variety for a more colorful effect); this will form the tail feathers..
For the beak, cut the foam paper into a triangle. Stick it in place. Now, stick the googly eyes. Finally, secure the tail to the other end of the body. Fasten the bird to a tree twig with the help of a scotch tape. Your beautiful parakeet is ready to chirp and tweet! Looking for more such fun ideas for your little one? 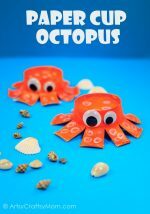 Do check out the ultimate list of 100 craft ideas for toddlers and preschoolers. Paper Plate Bird Craft using Torn Crepe Paper is looking very nice. i like the bird craft. Especial the tail. So colourful.. Never thought the octopus to be so creative.